Ajrakh textiles are printed on both sides in the dominant shades of indigo and madder and characterized by their use of mordanting and multiple dyeing techniques, they derive their name from the Arabic word Azrak, meaning blue. The richly printed surface of Ajrakh fabrics is achieved through a highly evolved process of scouring, mordanting, printing, lime resist printing, multiple dyeing in indigo and majistha (red) and washing. Dyed and printed with vegetable and mineral colours, the properties of the cloth exceed the mere aesthetic; the colours of Ajrakh are believed to be such that they are cooling in the heat and warming in the cold. Using resist and mordant techniques on natural dyes coupled with the rhythmic placements of the blocks, the karigar (craftsman) presents a work of art, enmeshed in beauty and skill. The word Ajrakh can be interpreted as the twinkling positions of the stars in an evening sky. To achieve the high art on fabric, the Ajrakh dyer uses the deepest blue of indigo and the molten red of madder eulogizing the divinity of the twin opposing forces of creation. It is the sheer beauty of form and feel that makes Ajrakh a prized fabric to grace any collection. It has the inherent ability to keep the wearer warm in winters and cool in summers. Ajrak craft products are made with natural dyes. The entire production of the products include both vegetable dyes and mineral dyes. Indigo is key dye. 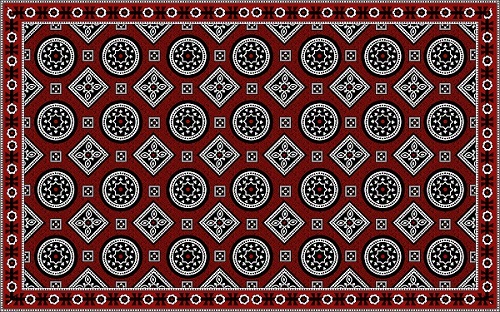 The Ajrak is usually about 2.5-3 meters in length. 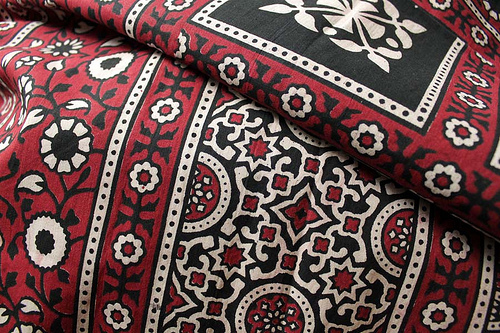 The authentic Ajrak is printed on both sides by a method called resist printing. The printing is done by hand with handcarved wooden blocks. Several different blocks are used to give the characteristic repeated patterning. Making the blocks is a considerable challenge since the pattern has to synchronize perfectly with the whole of the Ajrak as well as cover various areas against dye. The Ajrak print is employed within a grid, the repetitive pattern creating a web-like design or the central jaal. Apart from this jaal, border designs are also employed in the fabric. 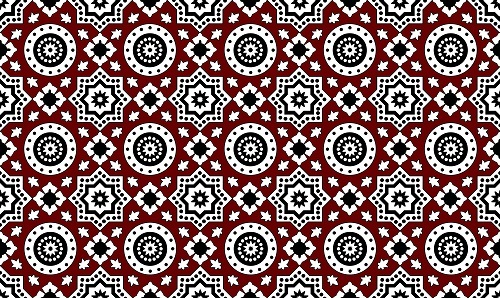 These borders are aligned both vertically and horizontally and frame the central field, distinguishing one ajrak from another. The lateral ends are printed using a wider, double margin in order to differentiate the layout of borders. Ajarak printing is a long process involving many stages of printing and washing the fabric over and over again with various natural dyes and mordants such as harda, lime, alizarin, indigo and even camel dung. The technique of resist printing allows exclusive absorption of a dye in the desired areas only and prevents absorption on the areas intended to be left uncolored. The raw fabric in full length is pulled exhaustively through the river many times, scoured, beaten, steamed, mordanted, printed with resist mud pastes from the banks of the river, covered with powdered camel dung and ground rice husks; dyed in deep madder and indigo. Unlike other processes of printing on cloth, where the colour is applied directly to the cloth, in Ajrak block printing, the fabric is first printed with a resist paste and then dyed. The process is repeated again and again with different kinds of dyes, to eventually achieve the final pattern in the deep red and blue hues. This gradual process is also very time consuming, as the longer an artisan waits before beginning the next step, the more vivid the final print becomes. Thus, the entire process can take upto two weeks resulting in the creation of the beautiful eye-catching patterns of the Ajrak. Water is vital to the production of Ajrak cloth. Artisans take the cloth through a process that can involve over thirty separate steps as first the cloth is prepared, then mordanted and then dyed. Through each stage the character of the water will influence everything – from the shades of the colours themselves to the success or failure of the entire process. Traditionally, Ajrak is the name of a block printed cloth with deep crimson red and indigo blue background, bearing symmetrical patterns with interspersed unprinted sparkling white motifs. An ancient craft, the history of the Ajrak can be traced back to the civilizations of the Indus Valley that existed around 2500 BC-1500 BC. The term“Ajrak”, may be derived from “Azrak”, meaning blue in Arabic, as blue happens to be the one of the principal colours in Ajrak printing. More than a fabric, Ajrak is a Sindhi tradition; found in daily usage such as hammocks and bedsheet to duppattas, scarves and even gifts. 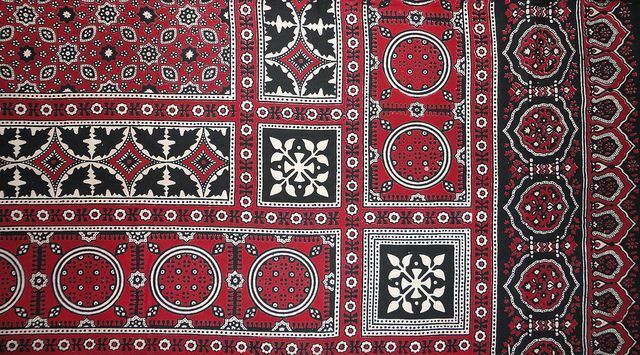 The highly valued Ajrak has also been made in Kutch for the Maldharis or cattle herder communities since the time Khatris migrated from Sindh in the 16thcentury. The Khatri community, whose name means “one who fills or changes colours,” printed cloth with the locally available natural dyes and water from the Dhamadka, the river that gave their village its name. Around 500 years ago the then Maharaval of Kutch invited a group of Khatri artisans to settle at Dhamadka near Bhuj in order to exclusively provide printed fabric to the nobility. These artisan branched out into a range of block printed and surfacial methods to serve the needs of various local communities but the pride of their trade still remain Ajrakh. This craft has been on a decline because modern, quicker methods of printing and bright chemical dyes are replacing the natural, muted colours and this slow and careful process of printing this traditional textile. With efforts of the master craftsmen and increasing awareness among the urban people, this crafts is slowly gaining momentum. 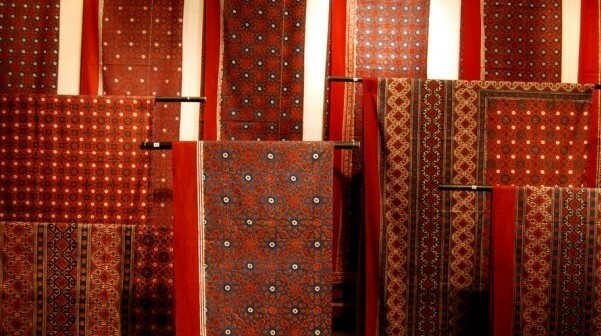 Because of being an environment friendly ancient craft, Ajrak, is slowly gaining visibility in the urban areas. Find Ajrakh on Direct Create, here!